Jet lag is the term used to describe the discomfort caused by flying across multiple time zones, and tends to be more pronounced when traveling in an easterly direction. It results from disruption of the body's internal clock and produces symptoms such as fatigue, irritability, disturbed sleep, forgetfulness, and poor appetite. Although jet lag affects people differently, on average, travelers need about one day to adjust for every two hours of time change. If possible, plan your trip so that you arrive at your destination in the early evening. Try not to sleep on the plane, and go to bed on local time. If you have to arrive in the early morning, try to get some sleep on the flight. Set your watch to your destination's time zone as soon as you board the plan, and try to eat and sleep according to that time schedule. Adjust exercise and meal times to the new local time as soon as possible. Dramamine or Bendadryl, over-the-counter drugs, can be used as sleep aids. Minimize your intake of coffee and alcohol en route, and stay well hydrated. 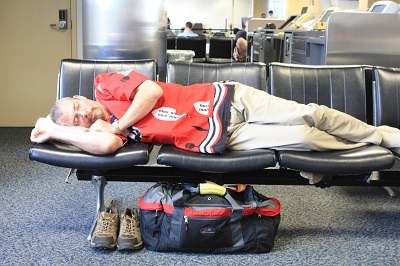 Symptoms of dehydration may accentuate any discomfort due to jet lag.